Minnesota’s first congressional district stretches across the state’s entire southern border. The district is mostly rural and also includes the city of Rochester, home to the Mayo Clinic. Last year, it was one of only three House districts in the entire country that flipped from Democratic to Republican. But Amy Klobuchar — Minnesota’s senior senator, running for re-election — won that region in her own race last year, comfortably. She ran up big margins around Rochester and held her own in many rural areas. 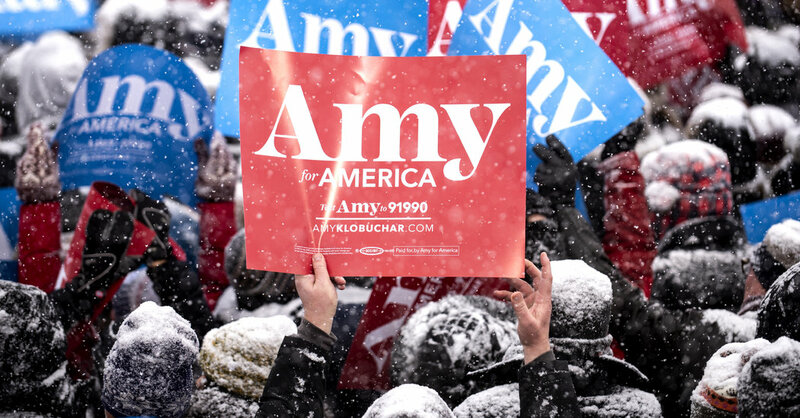 Klobuchar announced her presidential campaign yesterday at a snowy rally in Minnesota. She is not a front-runner. As of now, I’d reserve that category for Kamala Harris and, if he runs, Joe Biden. But Klobuchar is part of a strong next tier that includes Elizabeth Warren, Cory Booker and a few others. Any of them could win the nomination. I think Klobuchar and Sherrod Brown — the Ohio senator who may run — are arguably the strongest general-election candidates in the field, and my column explains why. If nothing else, the other candidates should study why the two of them have been so successful winning over swing voters. I mentioned above that Minnesota’s first congressional district runs along the state’s southern state. Do you know what state is on the other side of that border? Klobuchar’s path to winning the nomination almost certainly runs through Iowa, the site of the first nomination contest, early next year. She’s already fairly well known there, because Minnesota television ads spill over into Iowa, as Jacobs notes. If she can do well in Iowa, she may jump into the race’s top tier and be able to consolidate the support of candidates who drop out or fade after Iowa. Nate Silver, in FiveThirtyEight, lays out the full scenario for Klobuchar. You can also read and watch her announcement speech. I’ve previously mentioned her interest in antitrust issues. HuffPost and BuzzFeed published critical stories last week, quoting former staff members who say Klobuchar has a bad temper. I found some of the anecdotes upsetting. If Klobuchar really is a poor manager, I expect that she will struggle to run a strong primary campaign, which is more complex than running a Senate office. But I also know that a good number of presidents have had bad tempers — and I can’t think of a male candidate who has ever gotten so much early attention for it. The standards for female candidates really are different. For a fuller picture of Klobuchar, Maya Rao of The Star Tribune (in Minneapolis) has profiled her, as have Josephine Marcotty of The Star Tribune and Julia Felsenthal of Vogue. Jeffrey Goldberg, the editor of The Atlantic, interviewed her on a podcast last year. Opinion | John Dean: I Testified Against Nixon. Here’s My Advice for Michael Cohen.